Is it true that cats can’t become vegetarians? Saying cats are “obligate carnivores” doesn’t mean they like to eat meat and dislike crops – it means their bodies are unable to produce certain nutrients. They must get these substances from another animal that already converted them. This is one of the reasons carnivores don’t normally eat other carnivores / they cannot survive without feeding on animals who live off plants. This also means cats should not eat dog food. 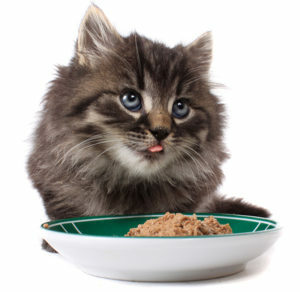 Even a little dog food can fill up a cat to the point where it doesn’t get enough of its own food and will suffer potentially dangerous deficiencies. As an example, a dog, human, or other omnivore can break down carotenoids from plants and convert into active Vitamin A. Cats must get active Vitamin A already converted from some other animal. Arginine is another good example. This is a building block for proteins that omnivores can produce themselves, but cats need to get Arginine with every meal. Other examples include taurine, niacine, and arachidonic acid.